A young man in France is being hailed as a hero, and super hero, after scaling the outside of a building with his bare hands to rescue a boy dangling from a balcony. Mamoudou Gassama was below the building in northern Paris Saturday evening when he and a crowd saw a 4-year-old hanging on to an adult while dangling from four stories up. The 22-year-old immigrant from Mali leapt, swung and climbed into action, scaling the side of the building with a startling grace. Videos shared on social networks showed him reach the child and pluck the boy back onto solid ground. A witness at the scene told Le Parisien that the adult standing with the boy did not have the ability to pull him in from the dangerous position. The child’s 36-year-old father faces a Monday court hearing on whether he lived up to his parental obligations and could face up to two years in prison, the newspaper reported. Gassama himself, dubbed “Spiderman of the 18th Arrondissement” by Paris Mayor Anne Hidalgo, told BFMTV that he had been at a Greek restaurant nearby watching a soccer match before he saw the situation and was worried that firefighters would arrive too late. “I like children a lot. I would not have liked something to happen to him in front of me. I ran and I looked at the solutions to save him,” he said. 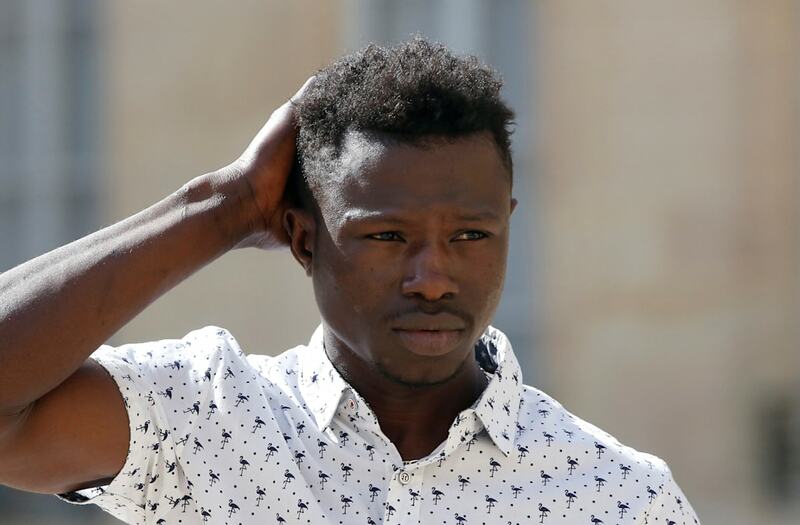 After news of his exploits spread across France and the world, Gassama met with French President Emmanuel Macron Monday morning and recounted his story. He received a certificate and medal recognizing his "act of courage." Hidalgo’s office said that the young man was also an undocumented immigrant to France six months ago, sparking calls by some for him to be naturalized.